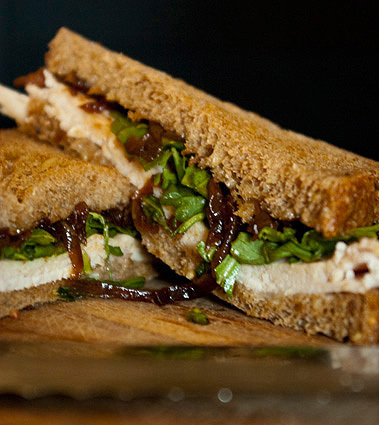 Imagine a wonderful turkey sandwich—wholesome 5-grain bread, turkey, tender, lightly smoked over a smoldering hickory wood fire—wonderfully accented by the crunch of fresh, peppery arugula together with a sweet and savory onion jam. 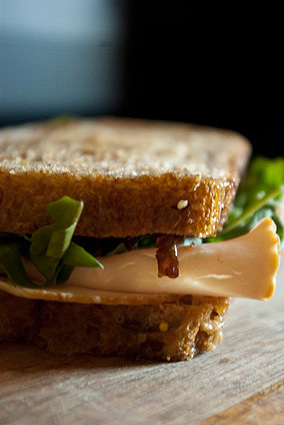 Like all wonderful sandwiches, it’s simple. So simple we can explore and experiment with our own creations. 1. Whisk together the egg yolk, vinegar, mustard, salt and pepper. 2. While whisking, carefully drizzle in the oil. 4. Season to taste with salt, pepper, vinegar, and a pinch of cayenne. Originally posted on March 6th, 2010. Gently cared for on December 17th, 2010. 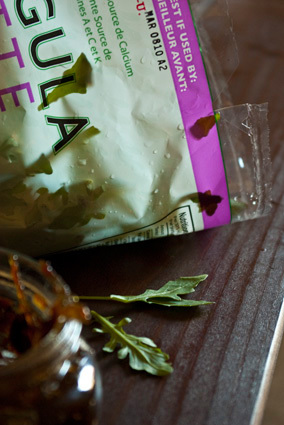 Wow, is that a picture of Kettle chips in the background of the sea salt? ’cause that would be really good as a side with the sandwich! Good job, I enjoyed the story. 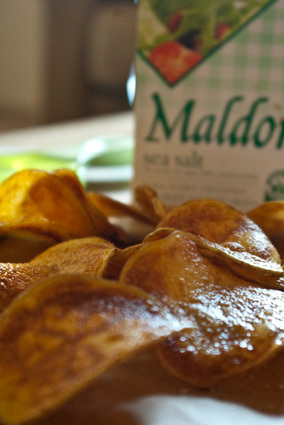 Yep those are freshly fried potato chips. Still experimenting with the frying temperatures. It’s really simple if you have a cheap 1/8″ mandolin slicer. Just slice a Yukon Gold or russet potato, rinse until the water runs clear, dry, and fry at 300-360 degrees until golden and crispy.